Like Alec in The Losers Club, I could spend the entire day reading. I've been a reader my entire life and find reading to be a wonderful escape to a world beyond my own. Alec loves getting lost in a book so much that it often gets him sent to the principal's office because he's reading rather than completing the schoolwork his teacher has assigned. Less than an hour into the first day of school, Alec is sent to the Hot Seat outside the principal's office for reading. The principal informs him and his parents that he must pay more attention in class and do less reading or he will be required to attend a six week summer school. In order to focus on his schoolwork and still get in reading time, he starts a reading club. 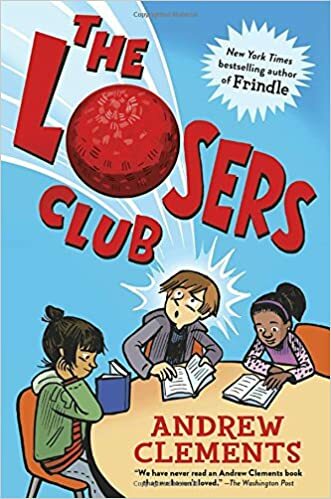 He doesn't really want others to join the club so he picks a name, The Losers Club, that will discourage others from joining. Running his club gets complicated when others want to join, he's subject to endless teasing about being a bookworm, and a girl he's starting to like is also a part of the club. Alec's love of reading will speak to any book lover's heart. There are references to many well-known books throughout the story. The Losers Club is more than a book about a kid who loves to read. Alec is dealing with challenges related to friendships, bullying, and school that will be familiar to middle grade readers. The book provides readers insight into how to handle the difficult situations of growing up. The positive relationships within the book also show how kids can support one another. With realistic characters, humor, and a satisfying ending, this is a book that will appeal to middle grade readers. This review is based on the advanced reading copy of the book which I received from the publisher, Random House Books for Young Readers.